The parish of Watton is situated in the Brecklands District of Norfolk. It lies north of Merton and Thompson, east of Saham Toney, south of Ovington and west of Carbrooke and Griston. The name Watton may derive from the Old English meaning ‘Wada’s enclosure’. The parish has a long history and was established by the time of the Norman Conquest. Its population, land ownership and productive resources were detailed in the Domesday Book of 1086. This document revealed that Watton possessed a church, mill, woodland and a large number of pigs. Aldreda held the parish lands before 1066 and by Ranulf son of Walter held them after this date. During the reign of King John (1190-1216) a market charter was granted to Watton and this Wednesday market is still held today. The earliest find from the parish dates to the Mesolithic period. This object takes the form of a stone macehead (NHER 8778). However, many of the early prehistoric finds date to the subsequent Neolithic period and these comprise flint tools (NHER 8773 and 8774) and various flint axeheads (NHER 8771, 8772 and 21584). The Bronze Age is the first period to have a definite site. A barrow (NHER 42674) exists on land belonging to RAF Watton, and excavations here in 2005 recorded a central cremation urn, together with a possible associated inhumation. Several Bronze Age flint arrowheads (NHER 8769 and 8770) have been recovered, including one from Watton Green (NHER 8769). The only other artefacts from this era comprise a set of seven copper alloy axeheads (NHER 8777), many of which appeared unfinished. Rather less evidence is available concerning Iron Age Watton. A couple of possible Iron Age pits have been identified (NHER 25014 and 39786) from the presence of pottery sherds in their fill. Sadly, no metal artefacts from this era have been recorded although a remarkable whetstone or pounder from woodland (NHER 36300) has been found. During the Roman period it is possible that a road (NHER 8786) ran through Watton as part of the east to west Roman road from Denver to Caistor St Edmund. Excavations found no Roman material along the course of the road but this does not preclude a Roman date. No other features of this date have been identified but metal detecting has recovered coins (e.g. NHER 8779, 17251 and 35347) and brooches (NHER 11500). Other more interesting Roman finds include finger rings (NHER 35348), bracelets (NHER 25014) and a ring made from a cut-down armlet (NHER 25827). Perhaps the most significant Saxon discovery in Watton was made in the 1950s. An Early Saxon inhumation was uncovered, and an analysis of the individual’s skull showed that the body belonged to a young adult male. 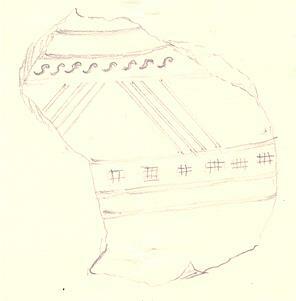 Sadly, the only associated grave good took the form of a sherd of stamped Early Saxon pottery. The majority of the other Saxon finds date to the early part of the period, and these objects comprise part of a girdle hanger (NHER 25827), part of a square-headed brooch (NHER 39299), a cruciform brooch (NHER 1031) and an iron spearhead (NHER 36300). A Middle Saxon coin (NHER 19235) and Late Saxon bridle cheek-piece (NHER 1031) have also been recorded, but later finds such as these are few in number. In the medieval period Watton was a prosperous market town with a church dedicated to St Mary (NHER 8795). This church has a Norman round tower of 13th century date and the core of the church is of this date. However, the church was altered in the 15th century and the exterior reclad in the late 19th century. The churchyard is a regionally important example of an ornamental churchyard. Sadly, much of the medieval town burnt down in a fire in 1674 so no other buildings survive. The site of the town (NHER 1031) has been suggested to lie to the north of the church in the ‘Watton Mount’ area. In addition, extensive metal detecting in 1998-99 has identified the possible location of the medieval market. This site lies to the south of the modern town and had a large number of cloth seals and coins, artefact indicative of trade. None of the manorial sites survive into modernity. Documents suggest that Rokeles Hall (NHER 8788) was founded in 1237 and may once have had a moat. However, the present Hall is of 17th-19th century date and the only water features to have been identified are two small ponds to the east of the Hall. Other more definite moats have been reported (NHER 8789 and 13290) and these together with Rokeles Hall may represent the locations of the three medieval manors known to have existed in Watton. The two medieval market crosses (NHER 19195 and 19197) in Watton were incorporated into the Clock House (NHER 19198) when it was constructed after the fire of 1674. Wayland Wood (NHER 39524) gives its name to a hundred in the Domesday Book of 1086 and as such is of medieval date. A survey of this area in 2004 found that a substantial wood bank encircled much of the woodland and recorded the presence of various ponds and hollows (NHER 36300). A selection of medieval small finds has been retrieved through metal detecting. The finest of these takes the form of an unusual buckle with a stylised animal head mount (NHER 39299). Other objects include a strap end (NHER 1031), silver coin (NHER 8782), a jetton (NHER 19233), a brooch (NHER 1031) and a gilded horse harness pendant (NHER 25827). A good number of the archaeological records for Watton relate to the post medieval period. Numerous residential properties were erected in this period, some presumably to replace those lost in the fire. Anyone interested in viewing these fine listed buildings need look no further than the High Street (e.g. NHER 40389, 40383 and 46121), Dereham Road (NHER 46141, 46312 and 46313), and Harvey Street (NHER 46314 and 46746). Perhaps the most notable building is Harvey House (NHER 19202); a fine red brick mansion largely built in 1720 in the Georgian style. This grand abode has a massive Tuscan doorcase on the third bay from the east. Wayland Hall (NHER 46122), occupies an important visual position in the town and was built in 1853 by E. B. Lamb. The exterior is of red brick and the interior features a hammerbeam roof in the main hall. Certainly the most intriguing post medieval building is Clock House (NHER 19198). This clock tower is narrow and stands three storeys high. The clock itself dates to 1827 and is set below the lintel of a medieval cross (NHER 19197), and above a shield depicting a hare and barrel. Additionally, wooden spandrels in the clock tower are felt to come from another medieval market cross (NHER 19195). The tower is topped with a cupola, which has a weathervane dating to 1820 – also in the form of a hare and a barrel. It was supposedly erected after the fire of 1673 as a warning point, and to have been refaced in the 19th century. Virtually all the visible façade is of latter date. The rear wall of the clock tower is now inside a recent link block between numbers 30 and 32 High Street. Watton also has a number of post medieval gardens and promenades. The Loch Neaton pleasure garden (NHER 33722) was originally a railway ballast pit formed in 1872. However, at some date between 1877 and 1893 this was converted into an ornamental water pond with a watermill at the north end. In 1907 it was presented to the town and a bandstand was made, but by the 1920s the emphasis had changed to sports usage. A post medieval bowling green (NHER 20527) also exists to the south of the road opposite clock tower and behind the former George Inn. The green was mentioned as early as 1681 and is now preserved in a private garden. Lastly, the Church Walk/Walsingham Way (NHER 33721) merits a mention. It was in existence as an avenue before 1792 but was established as a way to the church by the Enclosure Commissioners in 1801. The avenue was bisected by the railway in 1868 but was replanted in 1901-2 as Coronation Walk, with ornamental gates at each end given by Lord Walsingham from Merton Estate and an avenue of lime trees backed by hedges. Despite the refusal to remove the gates for scrap during World War Two they were removed in 1966; but the flanking railings remain in situ. This path has been certified as being of national importance as an example of an 18th century public walk. It also appears that the inhabitants of Watton were engaged in the process of timber working. The Ordnance Survey records two post medieval saw pits (NHER 13251 and 13252) where tree trunks were sawn into planks that could be then used in construction. It is possible that trees were felled from Wayland Wood for this purpose. Only a few post medieval artefacts have been recovered from Watton. These include fine items such as a 17th century silver headdress pin from Holland (NHER 25827) and a lead cloth seal decorated with a rose motif (NHER 25827). Other more mundane finds consist of coins (NHER 40121) and the base of a 17th century chicken feeder (NHER 17545). The most recent archaeological records for Watton relate to World War Two. Watton Airfield (NHER 8908) was used both by the United States Army Air Force and the RAF. Rumours suggest that Allied spies were flown from here before being dropped by parachute into Germany. After World War Two the station was used as a Radio Warfare Establishment and since 1965 air traffic management has operated from part of the site. During the Cold War surface to air missiles aimed at Russia were based here. The airfield closed in 1989. Two World War Two concrete pillboxes have also been reported. One survives in an overgrown state in a hedge to the northeast of the church on the north side of the lane (NHER 19203). The other was a very rare PBX U/F roofless and pentagonal pillbox (NHER 32423) that stood to the west of Lovell Gardens. This interesting structure is now partially buried. Thomas Sunley (NLA) 6 August 2007.